Julia Ferguson Siebel was born in Colby, Kansas, in 1915. Her family had come to the town when it was founded in 1886. She graduated from Colby High School and then went on to Lindenwood College, in Missouri, then to Northwestern University in Chicago, where she graduated with a B.A. in 1936. That summer she returned to Colby to celebrate her marriage to Chicago businessman George Edmond Siebel. During the next fifteen years, Siebel raised her two children, son Edward and daughter Janet, and took an active role in the Illinois League of Women Voters, serving on their state board and actively lobbying in the state capitol. She was on the editorial staff of Poetry from 1947-1950. Her stories appeared in New World Writing and The New Yorker. Mrs. Siebel's first novel, The Narrow Covering, published in 1956, received the Friends of Literature Award. Her second novel, For the Time Being, was published in 1961. Siebel divorced her first husband around the time that her second novel was published, and remarried in 1963. She and her husband, sculptor Giorgio Spadaro, lived in Chicago until 1968. During the time of their marriage he worked on the Pioneer Memorial Library fountain, in her home town of Colby. In 1968 the two divorced. She also completed an M.A. in Linguistics at Northwestern Universtiy that year. In 1969 she moved to California, where she continued to write and also took an interest in photography. She took workshops with Ansel Adams in 1969, '70, and '71. on land west of the Hundredth. at moon dark - and laughed. In the early 1950s, Julia Siebel began exploring the world of a writer. 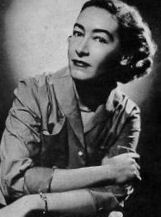 In 1954 she attended Malcolm Cowley's classes at the Writer's Conference at the University of Connecticut. By 1956 she had published a short story, "Home Ceremony," and a novel, The Narrow Covering. In exploring this new world of writing, she returned to an old one, to the Colby, Kansas, of her youth, to the Great Plains that she had left over 24 years before. She captured that time and that place, both are the core of the book, so effectively that she was hailed as a new writer of great promise. One who didn't is the main character, Ella Beecher, who is 16 at the beginning of the novel and commits suicide at the end, when she is 45 years old. In between, she has suffered a religiously fanatical mother; the death of her drunk father; the death of her gentle, loving sister-in-law; the suicide of her brother; an unfulfilled marriage; the ravages of the economic hardship and dust of the 1930s; and, finally, the death during World War II of her brother's son, whom she has raised from the time of her brother's suicide, and who is the person she cares most for in the world and identifies with most closely. Siebel said in an interview that the impetus for the book was the suicide of an acquaintance. Siebel was "trying to portray with dignity and sympathy the character of a woman...(so that)...her behavior would be understandable, first to me and then to all readers." Ella Beecher does come alive with all of her fears and doubts and insecurities, yet her suicide, like all suicides, remains difficult to fathom fully. Still, the enigma of her character and her behavior is deeply and complexly explored and the reading of the novel is, as Siebel hoped, an exercise in understanding. Even the language itself helps the reader to understand the despair of the character. At times it is Biblical, prophetic; at other times it is so direct, so frank, that it leaves no room for hope. The following description of the first dust storm of the 1930s shows Siebel's control of language, and also her ability to capture the experience of her own youth. There was one more good wheat crop, but the price fell so low, as the Wall Street market dropped, that it scarcely paid to haul the grain to town. And then the plagues began in earnest. Within three years after Mrs. Beecher's death the dust came. On a dull wind-hard day in March, they watched a brown cloud grow in the southwest, rise towering over them, brown and denser brown. The sun yellowed and went out. The town was lost under a night of dust. Ella saw the first one coming. She was shaking rugs over the porch railing when she saw the wall of dust moving up. Beatrice hadn't yet left for school after lunch, and Ella went in to her, gathering the rug under her arm as she went. The telephone rang. It was Tom. "Just sit tight," he said. "The boys are all right at school. You go down cellar if it gets too bad." His voice was shaky, high-pitched. "Are you all right?" "Oh, yes. We'll be all right," she said. "I wish I was home," he said, his voice rising. "Well, don't come out in it!" The girl at the switchboard cut them off. Beatrice wanted to go out and find her cat. Ella caught her at the door as the dun-colored mass rolled over the house and the light of the sky went out. "Never mind," Ella said, calling over the howl of the wind. "She'll find a safe place," slamming the door, turning the lock as if that would help. "Come on to the kitchen and we'll make some cookies." But in the unmoving air, in the shut house, crockery crunched on the kitchen table and their teeth gritted together. Running water left paths of mud swirls in the sink. "What if the kitten doesn't find a safe place, Mother?" Beatrice asked. But Ella looked at her and could not answer. If it hadn't found a place by now, it wouldn't. She took the child on her lap, big as she was, and read to her from Pilgrim's Progress. Their marker was at Christian's descent into the Valley of the Shadow of Death, the place as black as pitch, crawling with unearthly demons and satyrs, and Ella read until Chrisitian had come out of that place and caught up with his friend, and gone on. Beatrice was restless. She climbed out of the chair and went to get two of her dolls and brought them back to play on the floor at Ella's feet. She danced the dolls and sang to them softly, now and then glancing up at her mother and at the black blank windows. When the electricity went off, she got the old coal-oil lamp from the cellar and read by that. The storm lasted four hours. This is one plague Mother didn't see, Ella thought. This one she was spared. By late afternoon when Tom drove home with the boys, there was dull yellow light again and Ella could see far enough through the haze to see them coming. A few drops of heavy rain fell, leaving inch-wide craters in the drifts of dust on the porch, the walks, the lawn. The cat came out from under the porch, sneezing, mewing for supper. Beatrice gathered it up, fed it, brushed the dust out of its coat with a doll brush and kept the cat with her all night long. During the evening the phone rang, reports coming in. Tom answered and told Ella. Bood Nelson's wife must have gone out to close the chicken coop, too late to make her way back. When Bood finally found her, lying on her side beyond the barn, the dust drift sharp around her, she was dead, suffocated. Next day they knew there was no wheat left in Sutton County. For her next major work, her second novel, For the Time Being (1961), Siebel again explored the world of the Great Plains, this time from 1923 to the late 1930's. For the Time Being is about the Bembroy family: Paul, who has been temporary manager of a grain elevator for over seven years; his wife Christine, who is blind; and their three children. The family feels alone in the fictional town of Ludlow, Kansas, because they see themselves as living there only "for the time being." But they are also alone in relation to each other. Paul finds solace in his avocation as amateur astronomer; Christine finds comfort in music, learning to play beautifully on the piano by listening to recordings; the children live with separate dreams, one to be an actress, one a farmer, one a scholar. Ludlow's a good place to stay in. You got a little something you want to do, they take care of you and they let you be. He looked down Main Street and it seemed foreign to him, as if he were just passing through Ludlow, briefly, for the first time, as if it were a fleck on the earth with the plains reaching into it from all around. He heard the grain cleaner and conveyor running in the big elevator, saw two trucks waiting to unload, and it was as if even that elevator had no connection with him at all. Ludlow was a good place for his scope work but another would be as good. He could leave it in a moment--if there were any other place to go, or any way to leave. Paul saw his own longings splayed out in his three children like light through three sides of a prism, his light shattered and fragmented, becoming theirs. He couldn't help them when he didn't understand himself. Finally, though, it is in the cultivation ofthe private world of each character that these people find strength. Paul, especially, is rewarded when his star-gazing leads him to the discovery of a comet which will bear his name. The end of the novel provides relief from the apathy and lethargy the characters have been living in. In a sense, writers make their livings in the cultivation and communication of private worlds. In these two novels, The Narrow Covering and For the Time Being, Siebel made the private world of her own town, Colby, public. And she was rewarded with critical acclaim. Around the time that Siebel published For the Time Being, she was divorced from her husband. In 1963 she married sculptor Giorgio Spadaro. They spent a year in Italy before resettling in Chicago. Spadaro called her a literary perfectionist who taught him a great deal about artistic discipline. Siebel worked most of each day alone in her studio. Of her writing, she has said: "I love writing. Lots of writers feel it's a painful experience to write. I write very, very slowly, but I enjoy the process." During their marriage, Siebel and Spadaro went to Colby while he worked on the Pioneer Memorial Library fountain. Spadaro said that during the stay he began to truly understand hi wife's formality and desire for privacy: "In a wide open space, where intimate stories flow, she had to build a wall of privacy for herself and her work." Siebel's marriage to Spadaro ended in 1968. That same year she completed an M.A. in Linguistics at Northwestern University. In 1969, she moved to California, where she continued to write. She also became interested in photography, attending two-week workshops in 1969, 1970, and 1971 with the famed Ansel Adams. Julia Siebel returned often to check on her property in Colby, seeing it change over the years to a different town from the towns she created in her novels. But her creations evoke northwest Kansas of the 1920s and 1930s. They are complete worlds in themselves, deeply explored. Her novels deserve reading and re-reading, for finally they move beyond time and place and help the reader understand what it is to be human anytime, anywhere. 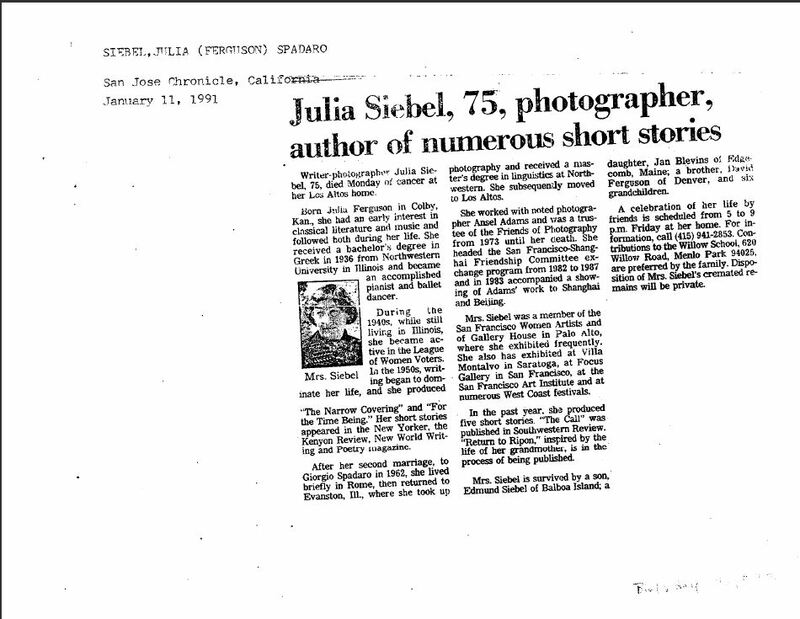 Julian Siebel's obituary in the San Jose Cronicle, 1991.